Brighton Vet provides modern, professional and affordable health care for your pets. We aim to make your pet feel at ease in our clinic with a caring and gentle approach to treatment and consultations. Our dedicated staff and leading veterinarians are all passionate about pets and avid animal lovers. At Brighton Vet, you’ll be fully supported with sound advice first and foremost. We know that helping our clients starts with providing a good understanding of health care issues and treatment options. With good advice and professional recommendations, you’ll be well equipped to make the best ongoing health care decisions for your pet. 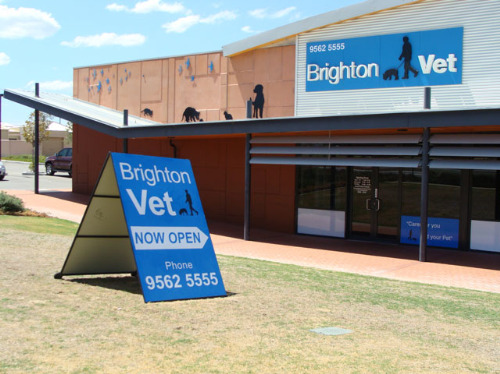 Brighton Vet has been an integral part of our local community for years. In that time, we’ve helped thousands of our clients cats & dogs, rabbits & guinea pigs, birds and even a few snakes. We also take in and treat injured wildlife. We’re open 7 days a week. Please call during the following hours to make an appointment. For after hours emergencies, please go to the Emergency Vet Hospital in Wangara or the Perth Vet Emergency in Yokine.